Fred. 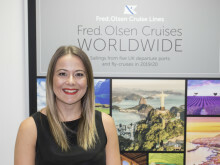 Olsen River Cruises has received the ‘Trusted Service Award 2019’ from independent review site Feefo, following river cruise ship Brabant’s inaugural season in 2018, serving some of Europe’s finest waterways. In its first year of operation, 156-guest Brabant received over 300 reviews, giving it an overall rating of four stars for ‘Customer Experience’. To receive this important ‘Trusted Service Award 2019’, Fred. Olsen had to receive at least 50 reviews on Feefo between 1st January 2018 and 31st December 2018, with a service rating of between 4.0 and 4.4. In fact, Fred. Olsen has received more than 100 reviews of at least four stars since launching Brabant in April 2018.